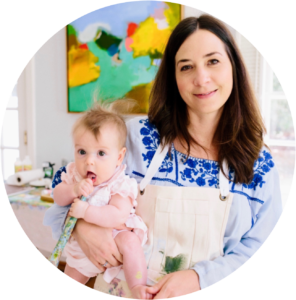 I am a full-time artist and full-time stay at home mother to three little girls — ages 5, 3 and 1. My day-to-day life is a balancing act of working as a professional artist and a stay-at-home mom. I am lucky to have my studio in my home so, I am able to fit work in throughout the entire day. And, because of this, motherhood has really become a part of my artistic process. My kids are in preschool (even the baby goes two days) for most of the morning and I dedicate this time to painting. I don’t make appointments or run errands — as soon as I drop them off, I race home, put the baby down for a nap if she is with me, and get into the studio. But, my children also often work or play alongside me when I paint. As an abstract artist (and a generally impulsive person), I find that having my children with me has actually been a benefit to my work: I am constantly pulled away — to get a snack, change a diaper, break up a fight. Because of this, I step back from the work often and am able to return with fresh eyes. And plot my next move. My art business is made up of both commission work and collections that I release on my own. Currently, I am working on a new collection of paintings that will be released on my website on April 12. A friend is hosting a party here in Raleigh on April 11 where the paintings will on display and for sale. I’m so excited to share this new body of work with people — it is bold and colorful and making me very happy. It is my goal in each collection to include many different sizes and price points so that collectors in all stages of life can purchase a piece. My path to becoming a professional artist was not a straight one. I minored in Studio Art at Wake Forest but never imagined I could actually make a career of this. I majored in English and after college, went on to get an MFA in Creative Writing with a concentration in Poetry. I thought I wanted to be a poet but soon realized how difficult it is to make a living at that. After graduate school, I worked on the editorial staffs of several regional magazines. I have always loved magazines and working for these publications was fun and exciting. I’ve always loved writing and these jobs gave me many opportunities to hone my craft while covering some amazing stories. I quit working full time when we had our second child. But, I had a deep desire for a way to express myself creatively. We had just bought a new house so, I began to work on paintings to hang in our own home. I posted one on Instagram and my sister said she wanted one. Then, my cousin said she wanted one. Then — I took a giant leap — and posted a painting and said “available for purchase.” It sold. (To a friend from Wake Forest!). Selling a piece of art was incredibly validating. I continued to post. And, they continued to sell. It goes to show that sometimes, allowing yourself to be vulnerable can often be the defining move you make on the path to success. I strongly feel that all the moves I made in my education and career brought me to this point: Though it was not a straight path, I made no missteps. My writing background is imperative to telling the story of my art. And, painting abstractly exercises the same part of my creativity as writing poetry. But, thankfully, people buy more paintings than poems. Being an artist is so much more than creating art! Selling, marketing, framing, sourcing and buying supplies, website design, writing for social media, PR and – ugg — accounting. I’ve navigated these challenges by setting a strict monthly schedule and sticking to it. So that I know – even if I am dying to be in the studio – on the first day of every month, the first thing I do is sit down and pay my taxes. I try and tackle the administrative side of the business in stolen moments throughout the day. I answer emails when my kids are eating breakfast, take them along with me on trips to the art supply store and tackle framing and finishing work after they’ve gone to bed. I’m proud that my three girls get to see me work hard every day for something I am passionate about. My oldest daughter, Avery, says that when she grows up, she wants to be an artist and a mommy. My middle daughter, Julia, says she wants to be “the person who makes the bubble gum.” So, in the least, I think some entrepreneurial inspiration is sinking in. The most important decision you will most likely make post college is who you choose to marry. Choose wisely. Because, inevitably, someone is going to have to make some sacrifices in their own career in order to make things work. My husband, Hill Davis (WFU ’05, JD ’08) is a lawyer and does not have flexibility in his work day. Because of this, he recognizes the need to support my career in other ways. I am so thankful for this. As an artist, I feel a great sense of connection to those people who choose to bring my work into their homes. Friendships that develop are often organic and I am grateful for the wonderful people my art connected me with. Go for it! But, keep your day job. Nothing stifles creativity more than having it be responsible for paying your rent. I’d like nothing more than the opportunity to continue creating art full time. I pinch myself everyday. Story published in March 2019. For current updates about Eleanor-Scott, visit her website.